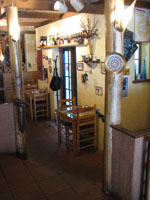 wood beams and warmth to spare "Post Magazine"
Mezzeta (October, 2002) While the tapas craze has yet to gain a solid foothold here, the Middle Eastern tradition of mezes—small shared dishes—finds expression across the GTA. This St. Clair West hot spot features eclectic décor that ranges from framed portraits of jazz greats and vintage Hollywood stars to maps of the Mediterranean, wall-mounted pistols and ornate scabbards. 681 St. Clair West, at Christie. Specializing in the Middle Eastern tapas known as mezzes, this one low-key take-away has evolved since it opened in the early 90s into a casual hacienda decked out with showbiz memorabilia. Bonus: live jazz Wednesdays from 9 pm. Double Bonus: Monday dinner, every second dish is a buck (with a limit of 15), and Tuesday dinner they’re a toonie; weekdays at lunchtime all vegetarian items are $2. Warning: as the sign on the wall map of the Mediterranean Sea advises, “Refrain from touching the map!” Best: from the card of more than 40 mezzes, the house Evergreen Salad of romaine, spinach, coriander, parsley and walnuts in light vinegary vinaigrette; somewhat sour Mezziki—cubed cuke in yogurt, recalling Greek tzatziki and India raita; garlicky Egyptian mush, and olive-oily purée of garlicky tomato, eggplant and green pepper suggesting Italy and Thailand; menu-described “exotic green beans” turn out to be crinkley Chinese long beans dusted with dill in lemon dressing; to finish, Crème Bavaria, vanilla custard laced Triple Sec, topped with toasted almonds and chocolate syrup. Complete meals for $25 per person (lunch $12), including all taxes, tip and a domestic lager.